Research indicates this Rivarossi-made steam locomotive model arrives in 1969. AHM’s 1977 catalog features the Casey Jones 4-6-0 with a retail of $54.98, by the 1980 catalog has the engine listed for $69.98. The Casey Jones model is not found in AHM’s 1980s catalogs. Catalog information notes a unlettered black version was offered, in addition to Arcade & Attica and Illinois Central releases. 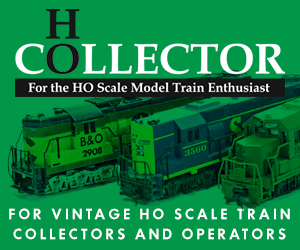 Though AHM’s Illinois Central model may be frequently spotted on eBay and at train swap meets, no Arcade & Attica examples are known to exist. In addition to this HO-scale replica, AHM also featured the Casey Jones engine in the company’s 1970s O-scale collection. The large Casey Jones release could be bought R-T-R (No. 7201-BU); plus as a two-part kit (No. 7201 loco and No. 7201-M motorizing kit).